In “NIL: A Fictional Memoir” by Eherin Khenney, readers contemplate life questions through the eyes of NIL. NIL is a successful manager for a large corporation who believes that his job is to help individuals assess their qualities to be the best they can be. His co-workers like him, yet they are tired of him. The problem is that NIL tries to do the same in his personal relationships and he finds that they often end up in conflict. Others don’t want to over analyze their every move as he does and get frustrated with him. He has great difficulty accepting that their thoughts are not the same as his and feels they are not open minded or willing to embrace the moment. The story takes us through how NIL sees his friends as well and is narrated from how they see him. I don’t believe once in the book was it told what NIL stood for. NIL appears to be very needy and needs others to take care of him but he has no idea how to have personal relationships with others. One can be book smart, yet not know how to interact socially with others, and this is NIL, in a nutshell. The author writes with ease; the flow of the book gives one the impression that the author feels the same about relationships and the world as NIL does. Given the author has a Master of Management degree; I can see where he gathered his material and thoughts for writing this book. For this reviewer, it was too much over analyzing with somewhat institutional writing, meaning, this is the way all should think and do. The narration was confusing and made the book difficult to read. It was hard to hold my interest after the first two chapters. Given the overall theme of the book, the cover is well presented. 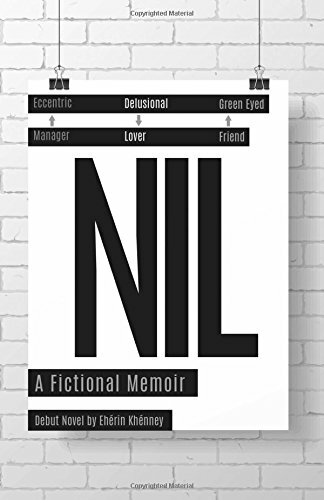 “NIL: A Fictional Memoir” by Eherin Khenney is not a book one can breeze through, as the goal it seems, is to have readers contemplate life issues. I think this would be a great book for readers who enjoy solving puzzles.